In mid-May 1943, the German Foreign office was troubled by a story that the Generalkommissar for Weissruthenien, Wilhelm Kube, showed an Italian delegation of fascists "a gas chamber in which the killing of the Jews was allegedly carried out" in Minsk. It was a mobile "gas chamber", since only gas vans are known to have operated in Minsk (see also here). "What is rather dubious, on the other hand, is the authenticity of the signature. Von Thadden usually signed his letters with the initials 'vTh' (followed by the date, day and month), while the signature of the note in question is by a different hand and is a rather clumsy attempted imitation – or reconstruction of von Thadden’s signature." 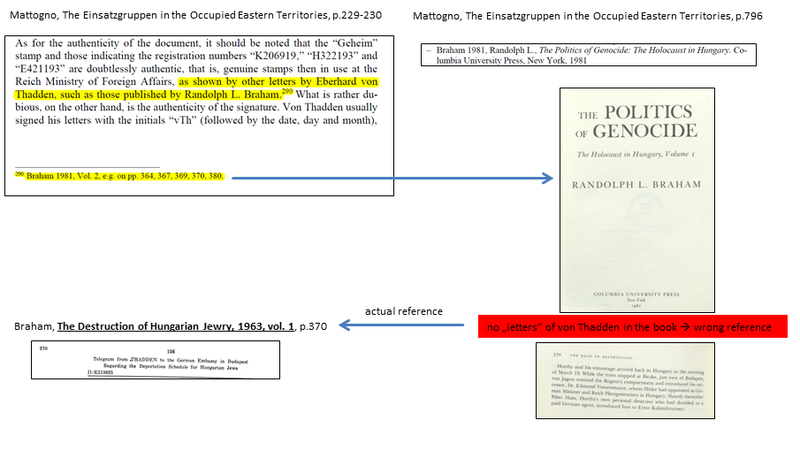 In the associated footnote, he cites from Braham's The Politics of Genocide (1981) examples of von Thadden's alleged "true signature". He also refers to his own remarks in the Italian edition of Mattogno/Graf/Kues' The "Extermination Camps" of "Aktion Reinhardt" (online here, p. 552; page numbers apparently do not correspond to the printed edition). Mattogno starts straight away with a wrong reference. 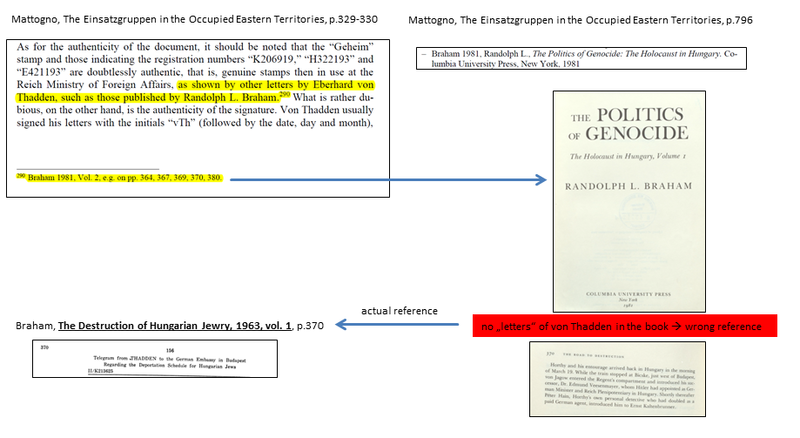 The documents he cites are not from Braham, The Politics of Genocide: The Holocaust in Hungary (1981) but from Braham, The Destruction of Hungarian Jewry (1963), an entirely different book (see Figure 1). 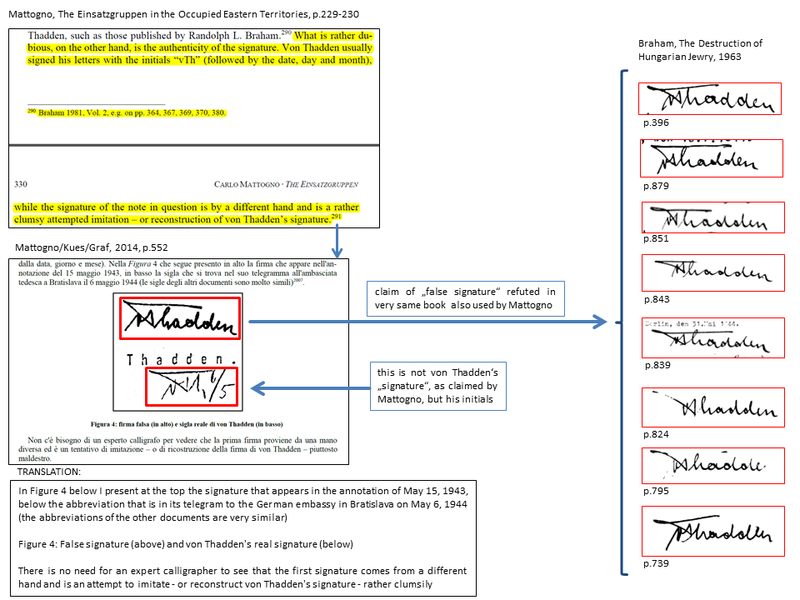 The examples, which are supposed to show that "von Thadden usually signed his letters with the initials 'vTh'", are not letters signed by von Thadden. The documents are a submission for telegrams and a comment. 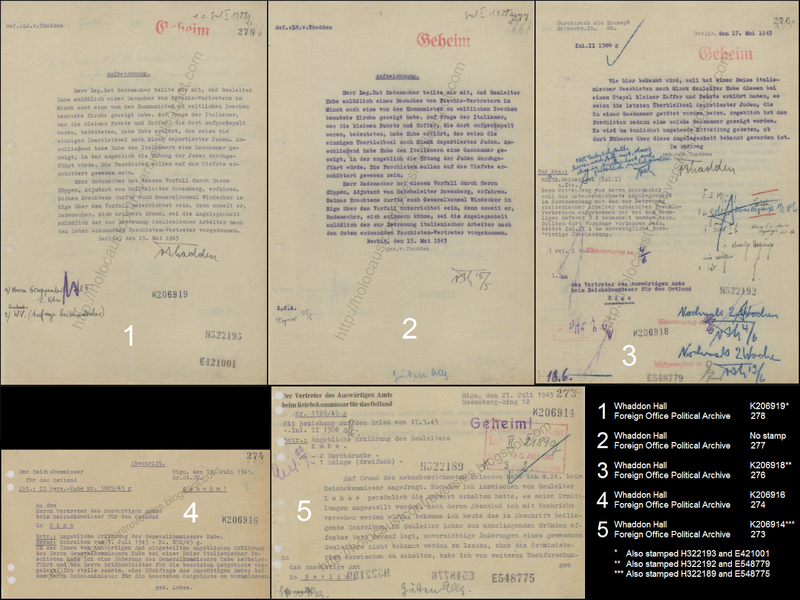 The initials on the documents are not von Thadden's signature but, well, just his initials. It is bloody obvious for anybody who has studied documents of German bureaucracy that initials followed by the date are a so-called Paraphe. It could mean approval, notice, certification, indication, but it was not a formal and legal signature. In 1992, the German Federal Supreme Court commented that "lettering that appears as a deliberate and intended name abbreviation (hand mark, initials) does not represent a formal signature". Now, the very same book, from which he cites the documents with Paraphe (initials), also contains numerous documents actually signed by von Thadden. What he has so confidently declared as written "by a different hand" and "rather clumsy attempted imitation – or reconstruction of von Thadden’s signature" is actually his real signature. This arrogance is only trumped in the Italian edition of Mattogno/Graf/Kues, where he adds that "there is no need for an expert calligrapher to see that the first signature comes from a different hand" (see Figure 2). An expert calligrapher, or in fact anyone less obsessed with negating Nazi atrocities, could have saved him from doubting the authenticity of a signature because confusing it with the persons' initials. One can really observe here how Mattogno is making up stuff just for the purpose of denying the Holocaust. He would have unlikely confused this if it were not for dismissing evidence on gas vans. He has seen too many German documents to pretend that he did not know about such practice. Mattogno is evidently unable to take a reasonable look at the evidence as soon as it is on Nazi mass murder. Any troublesome piece of evidence seems to have the effect on him that it suddenly turns off any residual knowledge, common sense and logic which may be left in his brain. 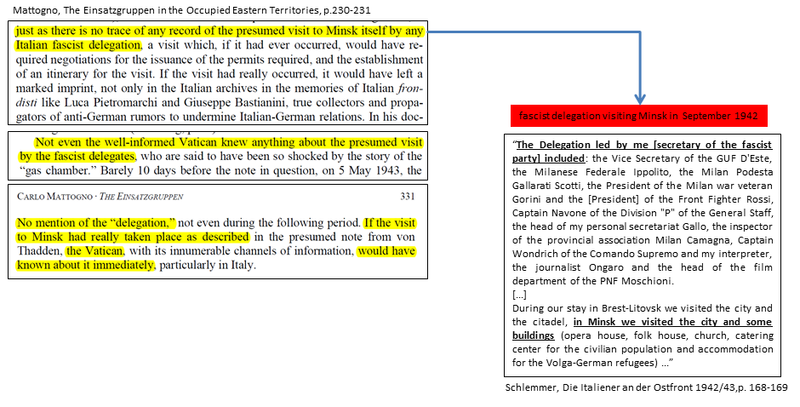 Between 20 - 29 September 1942, the Italian delegation lead by the secretary of the Fascist Party, Aldo Vidussoni, toured from Milan via Litzmannstadt, Brest-Litowsk, Minsk, Charkov to Millerovo near Rostov (see Figure 3). There exists film footage of the trip (see snippets here and here). According to this site, there should be even some footage of "Minsk Train Station. Vidussoni and the officers are walking on the [train] platform". On 7 October 1942, Vidussoni was flown to Hitler's headquarters in Vinnytsia. According to a note of the German Foreign Office from the day later, Vidussoni reported "on the strong experience which for him meant visiting the Italian troops on the eastern front" (Akten zur Deutschen Auswärtigen Politik, Serie E, Band 4, 1975, p.41). "An absolute rigour is manifested in regard to the Jews, severely treated and subject to restrictions of all kinds, even if there are those who work. I have been told by Italians living in those territories and sometimes even by the Germans in the mood for confidence, that shootings are at the order of the day and also [concerns] large groups of people of all ages and sexes. 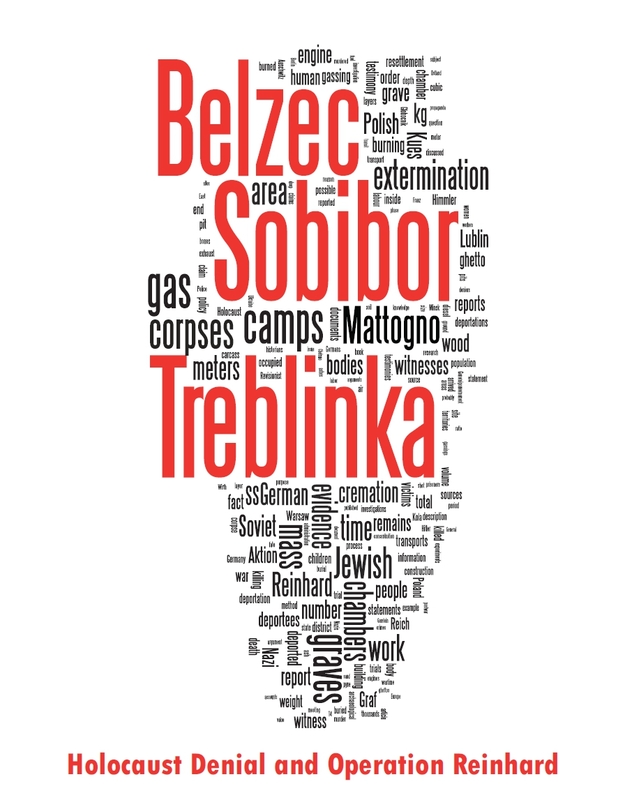 In Minsk, at the Opera House, we have seen the stuff of thousands and thousands of Jews murdered and it seems to be distributed to the population. They use, they say, only those who can work and until their physical exhaustion. What has most affected the Italians is the way of killing, to which, moreover, it seems that the victims resigned themselves. The population of entire towns and villages has been decimated by as much as a third or a half, in particular because of the elimination of the Jews." 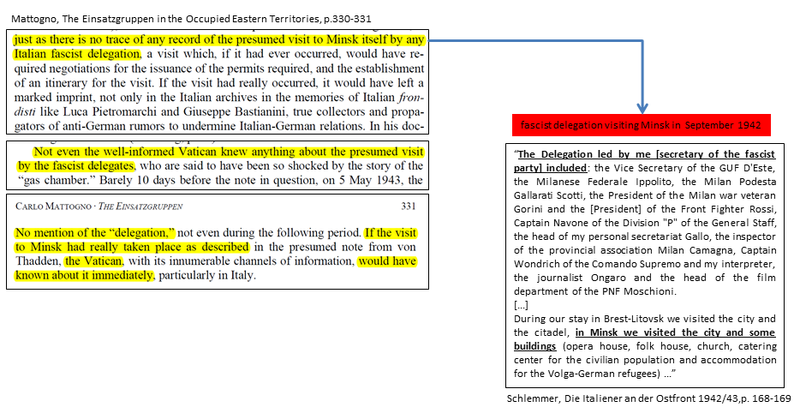 The description corresponds well to von Thadden's note that "on occasion of a visit by Fascist representatives in Minsk Gauleiter Kube had also shown a church that had been used by the Communists for worldly purposes. Asked by the Italians what the little parcels and suitcases piled up there meant, Kube had explained that these were the only leftovers of Jews deported to Minsk". It appears that the informant in the Ostministerium identified the location instead of the opera incorrectly as church, perhaps presuming that the damaged building was a church previously. The confusion may have been driven by the actual use of church buildings as theatres and cinemas in the Soviet Union, such as the Church of Saints Simon and Helena in Minsk which was "transferred to the State Polish Theatre of the BSSR". The fascist delegation also visited a church in Minsk according to Vidussoni's report (another difference in the representation of the Foreign Office is that Rademacher presumed that the delegation was to look after "Italian workers" when the delegation inspected Italian troops and its civilian personnel; the files of the Foreign Office do not date the incident, so that one cannot rule out that Vidussoni's trip eight month earlier is the origin of the issue). 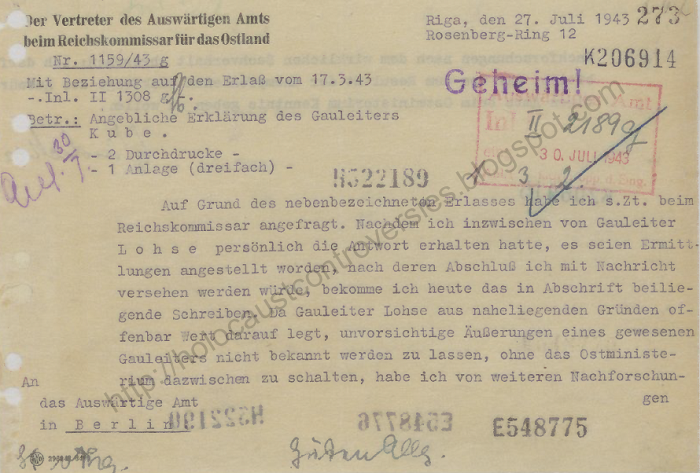 Several German documents confirm that the opera building in Minsk was used for storing the looted clothing of the Jews. 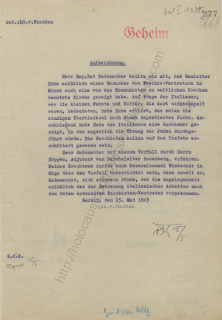 On 2 October 1942, just a few days after the visit of the fascist delegation in Minsk, a memo was issued by the Generalkommissariat Weißruthenien on "​Jewish clothing" and "clothing stored in the opera house". On 27 November 1942, a note of the Generalkommissariat Weißruthenien remarked that the "distribution of things from the opera house continues to be carried out directly through Mr. Dobler". (documents 30 and 38 in Холокост в Беларуси: 1941-1944 : документы и материалы; I thank Sergey Romanov for this source). The Ostland Öl Vertriebsgesellschaft complained on 11 December 1942 that "better garments from the opera [...] [are] traded on the black market" (Rentrop, Tatorte der Endlösung, p. 138, citing NARB, 370-1-634, p.3). 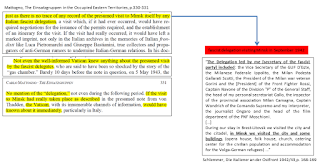 On the "gas-chamber" note from von Thadden, Mattogno argues "there is no trace of it in the documentation published by the archives of the German Foreign Office (cf. Rothfels 1978 and 1979), whence the document in question should have originated" (p.330; but writes in the footnote that "Browning (1978, fn 21, p. 249) indicates precisely the following archive reference: 'PA [= Politisches Archiv des Auswärtigen Amtes]. Inland II g 169 a, Thadden memorandum, 15 May 1943. T120/K781/K209619.'"). 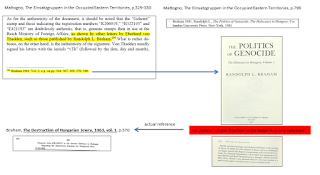 T120/K781/K209619 is not a reference to the original file but to its microfilm at the US National Archives. I don't know about the editorial decision not to include the note in the selected collection of Foreign Office files. But Mattogno could have easily learned about the whereabouts of the document if he just enquired at the Political Archives of the Foreign Office in Berlin. The document is not an isolated piece but part of a dossier with the signature PA AA, RZ 214, R 100848b, Bl.272-278. 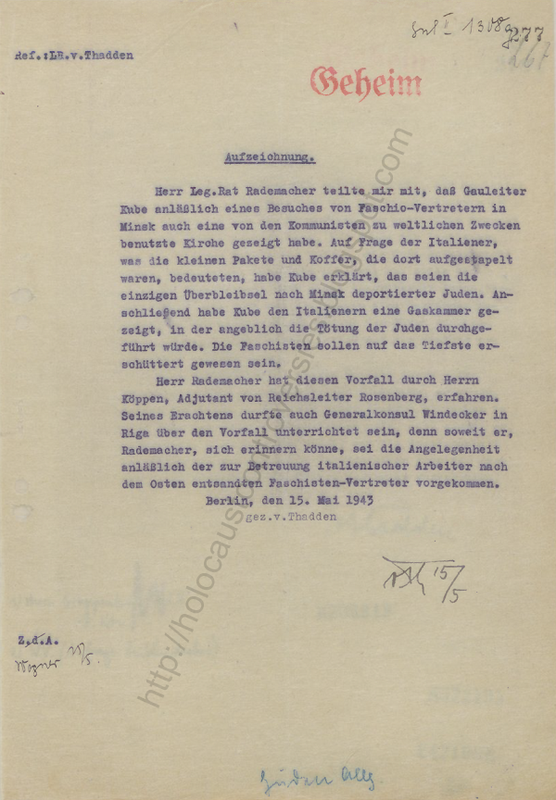 The matter was started by von Thadden's well-known note on the "gas-chamber" incident in Minsk, which was reported to him via his superior Franz Rademacher by the Reich Ministry for the Occupied Eastern Territories ("Ostministerium"). 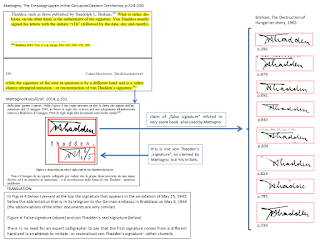 Apart from the signed note, there exists in the file also an initialed copy (exactly with the initials Mattogno confused as a signature) (Figure 4). 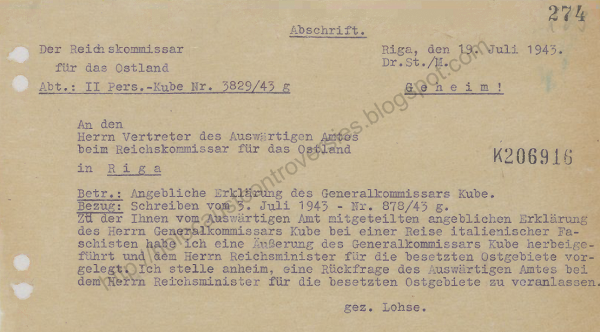 Furthermore, the incident with the "gas chamber" in Minsk is mentioned in the copy of a follow-up letter from von Thadden to the the Ostland representative of the Foreign Office, Adolf Windecker, of 17 May 1943. On 19 July 1943, the Reichskommissar Ostland, Hinrich Lohse, informed Windecker that he obtained "a statement of Generalkommissar Kube" on the issue, which was submitted to the Ostministerium (Figure 5). About one week later, Windecker forwarded Lohse's letter to Berlin with his comment that "for obvious reasons Gauleiter Lohse evidently sets great value on not revealing careless statements made by a former Gauleiter [Kube] without the Ostministerium acting as an intermediary" (Figure 6). Von Thadden noted on 13 August 1943 that his department leader "has decided that the matter should not be pursued further for the time being". Since the dossier ends at this point, Kube's explanation to Lohse about the incident is not known. However, in the light of Vidussoni's report to Mussolini it is all but certain that he showed the fascist delegation a storage site of clothing with the explanation that it was collected from killed Jews deported from the West. Windecker got the impression that Kube had made "careless statements" in this context - either towards the Italians or in his explanation of the matter to Lohse, both supporting that there was something to the story received by the Foreign Office. At the Opera in Minsk, the Italian delegation had to wonder how so many Jewish families had been killed. It stands to reason that Kube revealed to them the murder weapon - homicidal gassing. 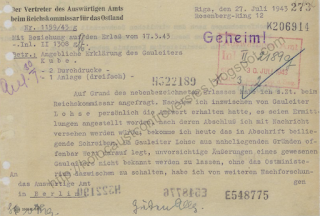 The German Foreign Office obtained via the Ostministerium that Kube reportedly told the delegation that the Jews "had been killed in a gas chamber" and that the "Fascists had been most deeply shocked". Vidussoni himself may have indicated this as well with the remark "what has most affected the Italians is the way of killing" (notable without explaining further details). >>> "The document is not an isolated piece but part of a dossier with the signature PA AA, RZ 214, R 100848b, Bl.272-278." If Irving's right about the "K" series Bates numbering, and considering what I detail below, this dossier was complied in Britain. Did you know that? 3 of the documents must have previously been in 2 different dossiers. They all feature 2 further sets of 7-digit Bates numbering. VTh's signed note 15 May 1943 [presumably along with his initialled copy of the note—which doesn't bear any 7-digit Bates stamping] was at one stage in an entirely different dossier to the copy of his letter to Windecker, 17 May 1943. I'm assuming the 3-digit Bates numbering was done by the archive which now holds the dossier. The stamp isn't on the Eichmann trial copy of vTh's signed note posted by Romanov. At least one document, "K206915", went walkies before this British complied dossier made it to its current home. Would they have filmed or skipped clear duplicates in a file? I think the burden of proof here clearly lies with BroI. You can't just insinuate that something might be suspicious until you've refuted the benign alternatives. But also this distracts from the point of the posting - how Mattogno treats the sources. > 3 of the documents must have previously been in 2 different dossiers. They all feature 2 further sets of 7-digit Bates numbering. You mean they were filmed for different dossiers (or whatever), since this is apparently what the numbers mean? Because if you mean that they were physically separated, you have to show it. > At least one document, "K206915", went walkies before this British complied dossier made it to its current home. You... do realize K206915 is just the reverse side of K206914, right? 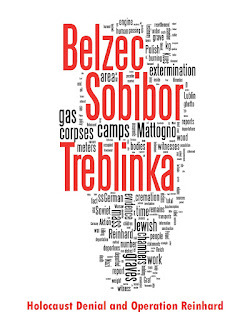 This blog has practically eviscerated the Holocaust deniers! There is not much more left for them. Keep it going, you are doing a service for everybody.